Ghost Money is the debut novel of Australian writer Andrew Nette, set in his one-time stomping ground Cambodia during the dying days of the Khmer Rouge. The country has been ravaged by decades of conflict, it’s fractured and politically unstable, the kind of place where one more dead body doesn’t make much difference. So when Australian entrepreneur Charles Avery goes missing whilst on business the local police aren’t even an option for his sister. She hires Max Quinlan, a half-Vietnamese ex-cop turned private investigator who specialises in locating missing persons. Quinlan has history with the area, professionally and personally, but once he lands in Phnom Penh he realises just how ill-equipped he is to hunt an elusive conman through the city’s seedy underbelly. He enlists the help of a scoop-hungry Australian journalist and his Cambodian translator, Sarin, and starts trying to shake loose some leads. Avery’s business partner has been brutally murdered, his body discovered by Quinlan in a Bangkok hotel room, and it seems that he isn’t the only person looking to track Avery down. Rumours of dirty dealing in the area’s lucrative, but highly corrupt, gem trade are flying around. Phnom Penh is like a wild west city, thick with local gangsters trying to carve out niches for themselves as Cambodia’s fragile government implodes, and the kind of shadowy expats who wash up wherever there’s a chance of an easy buck and police who can be cheaply bought off. Via boxing matches of rare brutality, down-at-heel hotels and bars full of dead-eyed women plying their tired wares, Quinlan and Sarin make desperate snatches for Avery, but the man is as insubstantial as smoke and they always seem to be one step behind him, just close enough to get caught up in the death which follows in his wake. It becomes clear that Avery’s business dealings go far beyond dubious gem trading, right into the heart of Cambodia’s paranoia-infested, blood soaked history. Setting a debut novel in Cambodia was a brave choice – it was closed off for decades and many readers, me included, will know very little about it when they pick the book up – but the potential pitfalls are also what makes Ghost Money such an intriguing read. Cambodia is largely alien to a western audience so Nette has a fresh patch to stamp his mark on, and, having lived in the area during the late 90s and covered it as a journalist, the authority to bring it off. The Cambodia of Ghost Money is sweaty and ripe with street smells, a precarious, unpredictable place riddled with corruption and casual violence. It’s populated by killers who live cheek by jowl with their victims and a array of shabby, psychotic or just plain wasted expats. And no matter where you turn the terrible scars of warfare are thrust in your face. 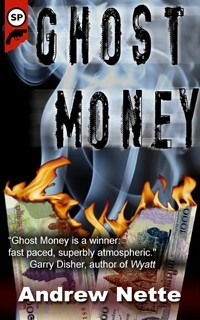 Ghost Money’s urgent, twist-filled narrative and boiled down prose is pure noir, but there’s more to the book than that. Nette never takes his eye off the political background to the story and handles the ramifications of warfare and extreme ideology with a sensitivity rare in crime novels. Ghost Money could well be The Third Man of Asian Noir.